Robert Selway Collins was born in Yeovil in 1889, the second eldest son of leather stainer William Henry Collins (b1867) and Emma Jane née Weatherley (b1858), originally from Gillingham. William and Emma were to have eight children; William Stearn (1888-1956), Robert, Henry Rodwell (b1890), George (b1894), Emily Louise (b1900), Albert Edward (b1903), Florrie (b1906) and John Alfred Charles (1910-1976). In the 1891 census William and Emma were living at 5 Camborne Street with their three eldest sons and William's two brothers-in-law. By 1901 the family had moved to Trowbridge, Wiltshire, where William worked as a fishmonger and chimney sweep. By 1911 the family had moved again, to 31 Hurford Street, Pwllywaun, Pontypridd, South Wales. William and his four eldest sons, including Robert, were all working as coal miners. In the summer of 1911 Robert married Emma Matilda Clements (1893-1967) in Glamorganshire. They were to have a son Richard (1913-1913) and two daughters. Robert enlisted as a Private in the 18th (2nd Glamorgan) Battalion, the Welsh Regiment at Pontypridd. It is not known when he enlisted, but his Service Number 28512 suggests it was at the beginning of 1916. The battalion had been raised in January 1915 as a Bantam Battalion and went to Porthcawl attached to 43rd Division. In the first week of June 1916 the battalion landed in France and concentrated near Lillers, going into the front line near Loos. Within weeks they were involved in the Battle of the Somme. The Battle of the Somme, also known as the Somme Offensive, was a battle of the First World War fought by the armies of the British and French empires against the German Empire. It took place between 1 July and 18 November 1916 on both sides of the upper reaches of the River Somme in France. The battle was intended to hasten a victory for the Allies and was the largest battle of the First World War on the Western Front. More than one million men were wounded or killed, making it one of the bloodiest battles in human history. The battle is notable for the importance of air power and the first use of the tank. At the end of the battle, British and French forces had penetrated 10 km (6 mi) into German-occupied territory, taking more ground than in any of their offensives since the Battle of the Marne in 1914. On 26 October 1916 Robert Collins was killed in action during the day-to-day trench warfare of the Somme Offensive. He was aged 27. 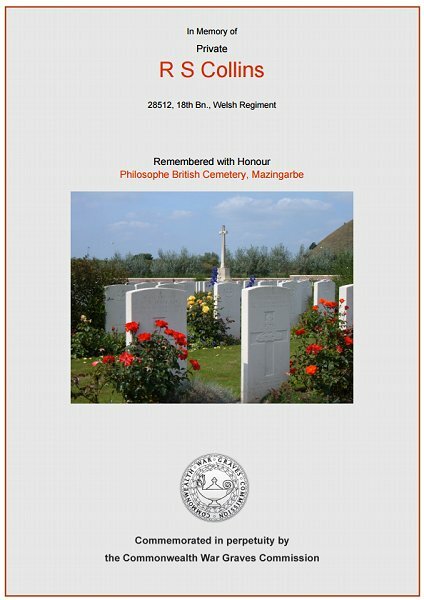 Robert was buried in Philosophe British Cemetery, Mazingarbe, Pas de Calais, France, Grave I.H.27. His name was added to the War Memorial in the Borough in 2018. The Commonwealth War Graves Commission certificate in memory of Robert Collins.